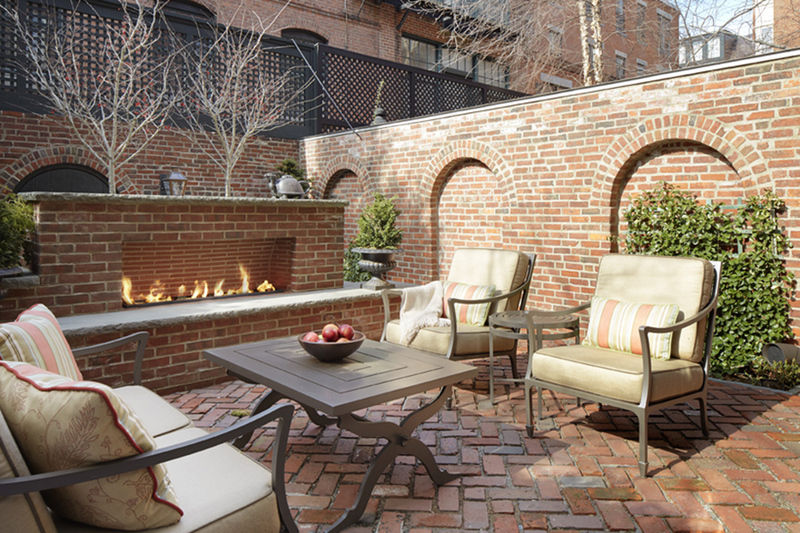 An overgrown brick patio in Beacon Hill had plenty of room for plants, but none for people. Designer John Cialone, partner and vice president at Chicago-based Tom Stringer Design Partners, decided to wipe the laid-brick slate clean to start. He removed the plants, furniture, and steps crowding the space to make way for a more polished, yet intimate, outdoor living room. First, radiant heat was installed in the bricks, so pesky snow and ice could simply melt away on colder days. Then, a sleek, linear gas fireplace was used to separate an outdoor barbecue from the main living area. “Because the materials are traditional—antique brick, the stone caps—it feels like it has always been there,” Cialone says. That goes for the potted shrubs, too, which make for a more refined take on the unruly vines that formerly dominated the patio.